Google News: Google announces that they will no longer collect or use student data for advertising purposes. 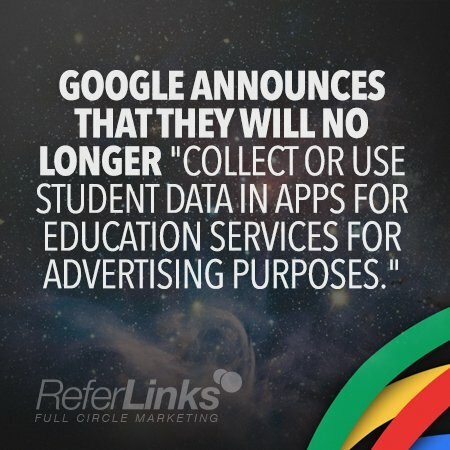 | ReferLinks Online Marketing Google News: Google announces that they will no longer collect or use student data for advertising purposes. Google News: Google announces that they will no longer collect or use student data for advertising purposes. One of the most influential names in the online marketplace, Google, has made a notable change in their privacy policies. Google claimed that they never used any of the information that they scanned to target any ads anywhere, but did admit that they scanned the contents of students’ email accounts used in Google’s Apps for Education. We’ve permanently removed the “enable/disable” toggle for ads in the Apps for Education Administrator console. This means ads in Apps for Education services are turned off and administrators no longer have the option or ability to turn ads in these services on. We’ve permanently removed all ads scanning in Gmail for Apps for Education, which means Google cannot collect or use student data in Apps for Education services for advertising purposes. Bout also mentioned that the massively influential company is making similar changes for their Google Apps customers, which includes Business, Government, and legacy users of the free version. They plan to post an update once these changes are completed. What this shows is the importance of knowing whether your actions will violate any privacy laws. Whether you’re a huge globally recognized company like Google or a small business owner, it’s crucial to keep this in mind. This entry was posted in Online Marketing and tagged Google News. Google Advertising on May 6, 2014 by ReferLinks Online Marketing.